In summer, many of us crave the ocean for the opportunity to cool off. But have you ever wanted to jump in water when temperatures are not quite idyllic? You may want to after encountering the world's best hot springs, which are perfect for warming up when temperatures take a drastic dip, as well as for total body revitalization. 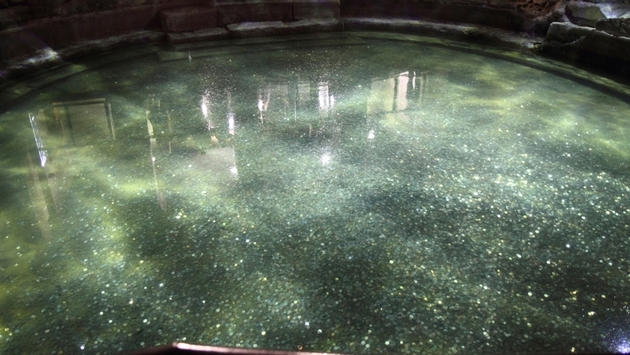 However, their soothing waters can be enjoyed anytime throughout the year, and they are well worth taking a dip. From the depths of Iceland to the ancient days of Romans, each of these thermal spas creates an extraordinary bathing experience only the wonders of nature can provide. So sit back and relax, and let the forces of nature vaporize your stresses. Iceland’s landscape is a natural, beautiful playground, so it comes as no surprise that it would flaunt one of the world’s most premier natural spas. In the heart of the country sits the Blue Lagoon, a year-round attraction where Icelanders along with tourists are free to soak up its healing powers. Due to the convergence of freshwater and saltwater about 2,000 meters underground, deposits of algae, silica and minerals create a unique body rejuvenating experience that is known to work wonders on the skin. But don’t be fooled by the color of the name of Blue Lagoon because once you’re swimming in this geological wonder that rises up to 100°F you’ll quickly see its blue tint fade into a white cloudy body of water, which contributes to its supernatural effect. As it name suggests, the English town of Bath was dotted with an array of bathhouses where Roman elite and Celts alike came to drown their aches and pains. But just because their baths are now fascinating spectacles doesn’t mean we can’t relive their age-old tradition. The Thermae Bath Spa offers much more than a place of relaxation (although you won’t hear one complaint from its guests). Here, they are given many opportunities to take a dip into the past as Britain’s only thermal spa's minerals cater to their bodies’ aching needs. From rooftop dips to an exclusive thermal treatment in the Cross Bath, there are a variety of ways to enjoy splashing around. Even the water, which is an attraction in itself, is believed to have been caused by rain centuries ago. With the winds constantly flowing from the Rockies, a hot spring may very well be perfect for warming up. That’s why many flock to the Old Town Hot Springs for relief. It is a popular destination that draws a sea of people with waterslides, massage and fitness areas, climbing wall as well as an extensive lap pool. Nevertheless, in the midst of activity buzzing all around, the mineral-rich pools were intended to create a relaxing space for guests, especially if they desire soaking in 98-103 degree water. There is more to this Australian attraction then wrinkling like a prune in its thermal springs. The Hastings Caves State Reserve is an exploration of nature at its best that also includes a tour of the Newdegate Cave. Decorated with stalactites and stalagmites draped along its rock walls, every step inches visitors deeper into Tasmania’s captivating history dominated by interesting wildlife and bizarre geological formations that mainly exists under the earth’s surface. And when guests want to blend a bit relaxation into this amazing subterranean adventure, the Thermal Springs Pool is just what the doctor ordered. Along with swimming in this hot bath, visitors can also take advantage of the picnic and dense jungle located adjacent to the pool. Are you looking to become one with nature? Then you’ll want to take a trip to the Tambo Hot Spring which flows in the Peruvian town of Yanque and is a prized possession of the Tambo Hostel. Just 20 minutes away from the hotel and set next to the Colca River, the scorching water is gathered from volcanic wells and set to cool before it is deposited into the tubs for use. Along with soaking in the steaming water, guests can also enjoy other adventures of the Colca Valley including fishing and biking.